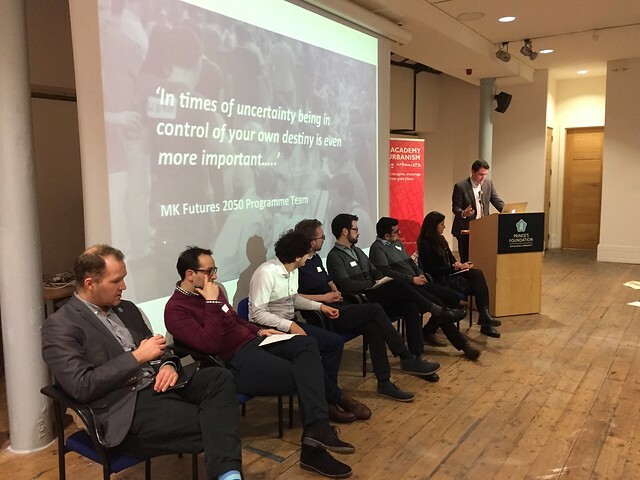 On Tuesday 31 January 2017, The Prince’s Foundation for Building Community hosted an event titled the ‘International Urbanism Studio’, which brought together Young Urbanists to share their experiences in both research and practice outside of the United Kingdom. The theme for this event was Rapid Urbanisation and looked to draw upon a broad coverage of world regions by learning from others global experience across the built environment sectors. With six main speakers presenting for about ten-minutes each, the event covered a range of projects across the world. The event was opened by Tom Perry of the Prince’s Foundation and concluded with Eleri Jones of Space Syntax. Below is a summary of each presentation. Tom spoke about the challenges facing Rapid Urbanisation in the 21st century and how the Prince’s Foundation is addressing this global humanitarian challenge. Three projects were presented in detail – including the Foundation’s work in Myanmar, Jamaica and Nairobi. The main discussion however was focused on advocating for planned city extensions – an urban planning approach that can offer sufficient, affordable and serviced urban plots in a timely fashion. The Prince’s Foundation has been implementing this through a Rapid Planning Toolkit that draws upon three drivers for change that enable cities and human settlements to improve the way they are planned, built, governed and eventually managed. Tom specifically concluded that there was a need for flexible masterplans that promote mixed, connected and compact cities. These plans however should be de-centralised and as transparent in their development to ideally provide an effective development mechanism. Roland’s lecture was on a project he has worked on with AECOM in Gaza, which has a particularly high unemployment level, low GDP per capita, limited housing and power supply. Roland did however speak about the uniqueness of Gaza and the importance of the place. The project was split into a set of baseline assumptions in which AECOM was able to create a spatial vision – including plans for urban development, transportation, energy, water and environmental measures. These were then to be phased over a period between 2020 in the short-term, 2030 in the medium term and 2050 in the long-term. The actions would create an expanded port and airport, light rail corridor, larger network of centres and urban expansion. Roland’s presentation concluded with a series of reflections from his experience working on the project. These included some of the challenges faced around delivery of such a large projects, but also how simple things (such as power) can have the biggest impact to people. Giacomo presented a unique study BuroHappold is carrying out on sprawling cities in the Middle East and how strategic planning can help steer development towards a more sustainable model. For this he focused specifically on a project in Buraidah, Saudi Arabia. The main discussion was around the issues faced in Buraidah. These included aspects such as a growing population, accelerating urban sprawl and increased driving demand. These aspects have been seen to have an impact on the health of the city – with Saudi Arabia ranking number five in air polluters, one of the highest estimated road traffic death rates and a high rate of obesity. These factors are the catalyst for the project and strategies presented. The presentation ended with a series of urban development strategies. Giacomo concluded with a series of lessons learned, including: urbanisation is fast, plan faster; address the immediate challenges, but plan long-term; and strategic planning can work in any context. Amer presented on the value of international corporation networks – speaking about projects in Canada, Syria, Ghana and China. 20 academic institutions, architectural practices, local governments and communities worked together to help implement the various projects. Capacity building was a main theme to the presentation, with Amer talking about the importance of synergizing architecture, urban planning, landscape and building technology into a single unit geared toward sustainable localised development. This was seen as important when engaging with communities, but it also brought on a catalyst for seeking / obtaining funding and ultimately building the projects (or preserving) projects in these areas. Amer concluded with some of the work he was involved with in Syria for Architecture for Change. This was a programme to provide education for Syrian Children in refuge camps. Some of the impacts were vital, such as the creation of wood working methods on buildings. Pepe spoke about building resilience to disasters in the Kyrgyz Republic. The Kyrgyz Republic faced a different series of issues from many of the previous speakers – such as decline from a transitional period, including a shake up to the political system in the country. Given this background, Pepe spoke about the need for the project to strengthen urban resilience to disasters – including the integration of disaster resilience in urban management. This involved a review of the current legal framework, practices of resilience in spatial and land use planning, plus a review of housing design and construction. This proved a need for training curricula in urban planning and housing, which was presented to local stakeholders. Pepe concluded with some of the challenges faced when working internationally. At a simple level it was the language differences and work culture, however Pepe also spoke about the challenges with capacity building and the need to raise awareness to the local stakeholders. Viral provided an interesting transition back to UK practice, with a presentation on key issues with the UK Planning System and the importance of sharing international experiences. Issues covered including housing, regional imbalance, infrastructure delivery and energy. Related to international practice, Viral shared his experiences with the Commonwealth Association of Planners, which is a group of young planners who can share ideas internationally. This has been critical in developing the skills in the commonwealth, but also ensuring that young planners contribute to the well being of society and the creation of sustainable settlements. Collaboration was again a key theme that has made this work well. Viral concluded with encouraging others in attendance to collaborate with relevant national and international organisations. Members can also support research and funding collaborations being prepared by others – using their expertise in the built environment. Eleri concluded the event with a presentation on foresight and rapid urbanisation. Her presentation started with an explanation of ‘foresight’ and the need for this in the UK, but also how it can be used to help improve imperative problems such as sprawl, decay and pollution. Foresight in practice is however slightly different and all the more challenging. Eleri spoke about three trends – including the importance of city networks, science of cities and creating visions. The work of Space Syntax has proved invaluable in understanding how cities are connected. It has also improved the development and understanding of service accessibility by placing importance on interconnected urban models – eventually creating solid city vision. Eleri ended with a quote from the Milton Keynes Futures 2050 Programme Team, which stated that ‘in times of uncertainty being in control of your own destiny is even more important’. This was a fitting conclusion to the event and summarised the need for foresight. What are some of the key challenges faced when working internationally? One delegate noted that political will was a common theme across the presentations. This did seem to be a reoccurring trend on the challenges faced when working internationally. Tom mentioned that many of the projects worked on by the Prince’s Foundation face difficulties when the community is not involved. The other speakers supported the importance on community collaboration as the main catalyst for a project’s success / failure. The common response to this question is that design and planning principles are fairly universal, but issues faced locally can vary drastically. Giacomo’s experiences in Saudi Arabia were quite interesting in such conservative contexts. One delegate mentioned the need for more women to get involved (even highlighting that only one female speaker was on the panel). These are issues that are faced across the world, however universal principles to improve on can provide a valuable context for international planning. Site-specific involvement is more upon the collaboration between local stakeholders to start addressing. This question drew upon Viral’s presentation, which illustrated the importance of collaborative planning across various countries. One delegate mentioned that the UK has an established university system in the built environment disciplines that can help share knowledge between various regions. One delegate mentioned that if this is the case, the UK should prove itself as a leader in promoting universal principles (e.g. politics, design, etc.). Check out the Flickr album from the event on the Academy’s Flickr page by clicking on the image below.